Despite fifty years of continuous publication and a breathtaking total of nearly 18,000 strips composing its canon, there are two qualities which speak to the critical worth of Charles Schulz’s Peanuts beyond simple longevity. The first one (appropriately enough, given the often scriptural nature of the strip) is an issue of faith. A Peanuts fan, no matter when the attraction is embraced, stays a Peanuts fan. While the strip has its detractors and critics (whose complaints center either on an understandable but erroneous perception that Charlie Brown and his fellows march among the ranks of the four or five dozen categorically insipid newspaper dailies wherein the heartwarming misadventures of smart-alecky tykes compose the entirety of the content, or a dismissive aesthetic sneer over Schulz’s sparse, seismic line work), it does not suffer apostates. No one who’s learned to love it once ever loses the love. There are fans and those who are not fans, for the former, the work impresses and endears too thoroughly to allow for their divorce. This endearing catalog — and its eminently embraceable appeal — is now being given its most thorough acknowledgement by way of The Complete Peanuts, a titanic undertaking some two-and-a-half years into its progress and ultimately expecting to compose a twenty-five volume reproduction of every daily and Sunday Peanuts strip in hardcover format: two years’ worth to a book, one new volume released every six months, black-and-white, and produced from the originals when possible. Completists shudder with delight even as their bookshelves groan in dire expectation. Publisher Fantagraphics — for whom similar reprint albums are familiar efforts; previous undertakings include Winsor McKay’s Little Nemo in Slumberland, Elzie Segar’s post-Popeye Thimble Theater, and the daily and Sunday Superman newspaper strips, among many others — has taken on a forbidding task, the fruits of which have recently made it to the twenty percent mark. With Volume Five, the first ten years of the strip have been collected in their entirety for the first time in history. The earliest Peanuts strips have rarely been collected in any reprint volume, likely because the most marketable iteration of the cast of characters had yet to come into its full numbers or proscribed roles. Neither Linus nor Lucy have any presence in the strip in its debut, nor do Pig-Pen, Peppermint Patty or — predictably, given the climate of the time and considering the editorial fuss his later inclusion apparently generated in the strip — Franklin. Instead, the original Peanuts consisted of the blonde gossip Patty, her mudpie-making co-conspirator Violet, and the otherwise ill-defined Shermy, the latter two of whom made occasional appearances (though little impact) in the strip further into its life. Good ol’ Charlie Brown is there, less a welcome mat and more a semi-malicious prankster who as often as not gets over on his pint-sized pals: not quite the hero of the strip, but usually the equal of his peers. Snoopy exists pre-verbally, looking so much more like an actual dog that his resemblance to his well-marketed incarnation is limited to white fur and black ears. Perhaps already feeling the need to introduce archetypal characters invoking classic stage dynamics in the commedia dell’arte, Schulz introduces pint-size pianist Schroeder within the first volume. He emerges near-fully-formed into the strip as its first newly arrived cast member; within a sparse few weeks, he’s displayed his virtuosity at the piano and becomes the first recognizable artifact of the eventually canonic Peanuts cast. 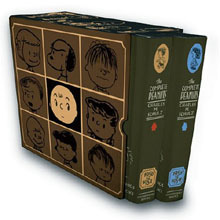 That the first few years of the strip have only infrequently found themselves on collectors’ bookshelves owes much to its embryonic state; seen as a coherent whole, the first several years of Schulz’s efforts are grossly unremarkable and awkward, focusing on a strict and inflexible four-panel layout for the set-up and execution of simple feet-flying-out-from-under “PLOP!”-style punchlines. In its earliest stages, and through as much as its first six or seven years, Peanuts is effectively a gag strip, bereft of the continuity which would make many of the characters’ peccadilloes and ponderables stalwart foundations of humor and wisdom. Gags about candy-stealing dogs and mudpies dominate; hurt feelings are caused by vaudeville setups rather than the complex psychological interplay of the children who populate the strips, described by fellow cartoonist and Peanuts enthusiast Al Capp as “mean little bastards, out to hurt each other.” Charlie Brown’s angst is as often cured by a hearty chase and the occasional thump upon his round head. The jokes, more so, are the common fodder of the child-populated newspaper strip, gags of juxtaposition wherein little shavers remark upon the adult world with seeming wide-eyed foreknowledge. Charlie Brown worries about “this new generation” and finds himself concerned with grey hair. The point of the strip seemed to be to make adults laugh at the follies of children — far from the strip’s later incarnation as an existential mirror of universal humanity. By the second volume, the small sparks of sensitive genius begin to emerge from Schulz’s cast, even as a fuss-less, pie-eyed Lucy crawls about, only beginning to become a vexation upon poor Charlie Brown’s spherical head. Snoopy’s lack of literate expression slowly evolves into thought balloons and the jovially dog-like character traits of running around wildly, knocking things over, and occasionally imitating his fellow creatures. Pig-Pen arrives in this volume — a one-note joke within which Schulz finds new life, returning to the character’s shtick with fresh perception upon each viewing, imbuing a greater depth, sensitivity, self-awareness and proudly flawed humanity. That the character was always minor, and perceived as a novelty by casual readers, has little bearing on the fact that he was the herald of Schulz’s celebrated technique: the intense psychological study of behavioral traits taken to their infallible absurdity. Critics of Peanuts often single out characters like Pig Pen as examples of its stolidity — that the characters are defined by their scant characteristics; that they age indiscriminately and irrelevantly, are eternally five or four and never grow up or beyond their failings and flaws. Such criticisms miss the point: the children could grow, but what would be the purpose? What further indignities could compare to those they suffer as children? Pig Pen’s pride in his own physical debasement is as eternal a consistency of character as Charlie Brown’s low self-esteem, Lucy’s threat-derived authority, the wisdom Linus finds in the gulf of security and insecurity. It’s subversive world, a very Fifties-style, quasi-Beatnik world of dissolution wherein permanence is a greater challenge than change. Charles Schulz’s life spoke to this kind of difficult permanence. A native of St.Paul, Minnesota, when the success of Peanuts allowed him to move to a new home in vibrant, expansive California, he chose to model as much of his Santa Rosa residence after his stark Minnesota home as possible. His legacy to his adopted city includes an ice-skating rink, a nostalgic folly reminiscent of something a wealthy Charlie Brown himself might do later in his own life — remodeling financial success and worldwide notoriety into replicas of what success had encouraged him to leave behind. Saddled with the nickname “Sparky” by a visiting uncle, and seemingly more comfortable with it than his own given name, Schulz was an isolated, independent child. Moved ahead two years in grade school, smaller and less confident than his classmates, Schulz never disguised which character in his strip was meant to represent himself. Like Charlie Brown, Schulz’s own father was a barber, and the blockhead’s own heart-wrenching, garment-rending paeans to his struggling father’s occupation should be read as great sympathy from the creator to his own father. Like Charlie Brown, Schulz was unappreciated and outclassed at most sports. His tribulations with his own “Little Red-headed Girl” (the serial reproduction of which remains material for future volumes) remain well-documented, a gentle rejection that the artist himself clearly felt deeply. Even in his success, Schulz, in “Good Ol’” fashion, had to endure a lifelong complaint — he found the title “Peanuts” to be disrespectful, confusing and meaningless, hung around his neck by his first editor. That Schulz should become the world’s most famous cartoonist, all the time seething over an unwelcome sobriquet, is as textbook a humiliation as a football wrenched away at the last moment. Less typical of Charlie Brown’s life was Schulz’s own entry into adulthood which, while handled with a classic sense of Midwestern unflappability, serves as a possible argument as to why he required his creations to endure only the humiliations of childhood. Endearingly close to his parents, Schulz was cast off incontrovertibly in February of 1943 — answering a draft board summons, he left the side of his beloved mother, whose fatal cancer claimed her even as he boarded the bus for basic training. He survived the Second World War, serving in a machine gun squad and seeing heavy action, and returned to a fractured timeline, separated at a point of his greatest isolation — he was his mother’s son when he left, a soldier while he was gone, and not yet a cartoonist when he returned. Returned to St. Paul, Sparky Schulz had somehow been liberated of an important continuity of his own fresh adulthood. Interviews taken from these volumes gave Schulz an opportunity to speak of regrets and grudges, of which he clearly harbored many. At some point in his cartooning of Peanuts, these feelings began to emerge and overrun the gag component of the strip. Any fan or historian can point to their defining moment of choice, when the irrepressible weight of the existential universe first crashes like flying saucer paranoia into the placid, set-up-and-punchline serenity of the Peanuts gang’s quaint, suburban neighborhood. Rather than a lightning-strike of a moment wherein the nature of the strip changed irrevocably, it’s a series of small humiliations heaped upon the slim shoulders of Charlie Brown which herald the change. His kite falls for the first time; Violet (sitting in for Lucy, who’d take over this role later in the life of the strip) first rips away the football from his chicken-winged and purposeful dash; Snoopy haughtily ignores him for some perceived slight: one by one these little weights are added to the side of the scale by which the value of Charlie Brown, the goat, is measured against Charlie Brown, the hero. The strip becomes more heavily populated, but rather than victims of Charlie Brown’s pranks and peers in his scampish misadventures, the cast is populated with characters who are flat-out better than Charlie Brown, or at least ignorant enough of their own failings that they fail to suffer his soul-crushing ennui — such as his sister Sally, born into the Brown family (in Volume Five) no less hopeless in her pursuit of educational or romantic success, but blind enough to her own faults that she yet emerges from fruitless pursuits the champion. The gems of the strip begin to shine, and not only those which evidence Schulz’s profound wisdom of pathos and failure. Schulz the artist begins to shine as well, and artistic marvels displaying more than the craftsman-like hand and stolid line of his earliest strips emerges. In Volume Three, Schulz experiments with a visually stunning “Martian” serial, wherein a fishbowl-helmeted Charlie Brown plays at being a visitor from Mars, while Lucy — with seemingly genuine interest — gently pesters him with questions. Besides being a rare example of the two characters giving themselves up to a mutual fantasy, it’s a typographic marvel, as Schulz renders Charlie Brown’s attempts at “Martian speak” with zipatone textures in his traditional word balloons, incomprehensible but striking clouds which Lucy either understands without flaw, or pretends to interpret free of editorial comment. Schulz shows off his illustrative abilities again and again during the life of the strip, such as a Sunday strip from May 22, 1955 where Charlie Brown dashes and dodges across high grass, deep undergrowth, filthy alleys and woodsy junkyards in order to catch a long fly ball. Critics of the strip’s sparseness, disacknowledging the effort necessary to produce fifty uninterrupted years of daily strips, would be well served to take a moment to appreciate the rich depth of field employed in these panels. Those who celebrate the strip’s spartan line, on the other hand, should take particular note of a February 2, 1956, Sunday strip in which Linus finds himself convincingly tangled in a play telephone’s cord, the matted mess of thick black lines utterly fluid and free of conflict with the central visual image of Linus himself, yet thoroughly communicative of the imbroglio of entanglement. It’s a tribute to the subtlety of Schulz’s drawing style. More than his illustrative skills, Schulz’s easy facility for absurd and non-Euclidean humor begins to show its head in Volume Three, such as a strip from June 5, 1955, where a combatative Schroeder recomposes a popular television theme of the day to promote the legend of “Beethoven — King of the Wild Frontier.” Likewise, Linus introduces the long-reaching self-awareness of the strip in September of 1955, asking for the first time of his highly critical sister who exactly will care what he does, five hundred years from now. Linus is also the first Peanuts characters — preceding Snoopy, who’d utilize this imaginative escape route almost exclusively in the strip’s later years — to understand the power of his own persistence of imagination in dragging victory from the ashes of defeat. Beginning in November of 1955, and repeatedly several months later, Linus turns a losing situation into a victory — by his own standards — simply by pointing his finger and thumb at his sister and declaring “Bang.” No more sure conclusion to an argument has yet been invented. By Volume Four, the characters’ insults and injuries become personal, and the strip embraces its ultimate archetypical dynamic. Where Charlie Brown was born of zingers (which is to say comedic one-liners intended to embarrass and engage, rather than the Dolly Madison snack cake of the same name, any confusion over which would be utterly understandable in this context), he becomes a personality born of bitterness and duo-directional anger. Come May of 1958, Charlie Brown responds to a taunting Lucy: “Does my having been born bother you?” She has no answer for that, but simultaneously, it’s not a victory in which Charlie Brown can take any delight. It’s just as likely that his having been born bothers him as well. Likewise, Volume Four introduces the Pencil Pal, Charlie Brown’s unseen and unheard-from aficionado from some far-off destination, and who provides Charlie Brown a sounding board for his own shortcomings and failures; as the ghost of his father was to Hamlet — less dire in consequence, perhaps, but certainly as incriminating and hounding — so is the Pencil Pal to Charlie Brown. Volume Five, collecting the strip up through its first decade, finally begins to catch up with the majority of Peanuts reprints familiar to those whose childhood bookshelves were burdened with Charlie Brown paperbacks. Covering the birth of Sally Brown (June 26, 1959) and her first crush on Linus more than a year later, Charlie Brown’s catastrophic “hero or goat” moment (September 3, 1959 and sporadically through May 1960), and the now robustly vociferous Snoopy’s battles against a looming icicle and mid-century America’s unstoppable highway construction threatening his doghouse, these strips represent to most readers what the strip was at its most fully formed essence, just shy of the introductions of Peppermint Patty and Woodstock. What contains these strips impresses as well, owing to the complete design package provided by Canadian cartoonist Seth (Gregory Gallant), whose soothing and understated design serves Schulz’s usually minimalist line style handsomely. That he’s contributed the defining visual impact of future strip collections along the lines of the Complete Peanuts collections (such as the collected Dennis the Menace of Hank Ketcham, also a Fantagraphics effort, and The Complete Calvin and Hobbes from Andrews McMeel Publishing) is both undeniable and highly fortunate. The collection, as it stands, beautifies any bookshelf. Inside the covers, Seth illustrates with imitative reverence the empty playgrounds and fence-lined thoroughfares of the Peanuts world, colored in duotone values and seemingly abandoned at soothing suburban twilights. Some missing panels, lost or damaged at time of publication, are reproduced by Seth when no other substitute can be found; if the mimicry is evidencable, it’s utterly simpatico and fails to jar the reader. Far from letting the volumes speak for themselves, each volume of The Complete Peanuts includes an welcome foreword or archival article on the subject of the strip and its humble, elusive creator (each volume also includes an index to the contents of the particular volume, but as the twenty-fifth volume quickly approaches it’s becoming clear that a separate appendix to the fully collected half-century of strips is as necessary as the collections themselves, considering the volume of possible annotations). The first volume exemplifies both the best and worst of the textual contributions, the latter by way of Garrison Keillor’s saccharine ode to an idyllic St. Paul (Lest you thought Minnesota would somehow not form the locus of his text piece) and a love letter to the Midwest’s long lost son which seems to eschew any of the strip’s bitter wisdom or, in fact, much more than the essential trivia of Schulz’s biography. Much more rewarding, from that same volume and indicative of the best the series has to offer, is a reprinted Comics Journal interview with Schulz conducted by editor Gary Groth and comics historian Rick Marschall. The interview, closing out the first volume, reveals Schulz as cantankerous, opinionated, conflicted and cross, but more importantly, self-indulged in volumes of thoughts regarding his own work and his contemporaries in the comics industry — and more so, profoundly aware of his own professional and moral foundations. It’s telling that, although crediting then then-newcomer Gary Larson for his bizarre and innovative Far Side single panel comic, Schulz — who himself began his career with single-panel gag contributions to the Saturday Evening Post — disdains the single panel format in all its incarnations. The further revelations regarding his opinion on the matter of his own faith, his concern for his own professionalism, and the simultaneously concrete pride and hopeless humility of his own creation, provide an intriguing mirror into a conflicted creator. Further text pieces vary from starkly insightful and analytical essays to rhetorical, nostalgic fluff. Surprisingly, Whoopi Goldberg’s insight is one of the few sparked entirely by an actual meeting with Schulz himself (respected newsman Walter Cronkite makes an entire introduction out of having never met Schulz) and a keen understanding of the anger which drove him as an artist and a human being. Simpsons creator Matt Groening likewise creates an informed narrative, seemingly academic in its approach — naming as it does dates and storylines which benefit from the indices of previous volumes — but inundated with a casual, thoroughly human warmth about a creator only briefly met. The best of these text pieces acknowledge how the strength of Peanuts was the tight relationship between the inextricably intertwined fatalist-humanist wisdom of the strip and the cynically contemplative worldview of its creator. This inseparability of creator and creation makes up, finally, the second great quality of Peanuts as a strip and Charles Schulz as a creator — an undeniable quality that is starkly poetic. Charles Schulz drew in isolation every day of his adult life, uninterrupted for fifty years, until forced by declining health to abandon his drawing table. That he died in serendipity, passing away on the same morning as the final Peanuts strip was running in Sunday newspapers across the country, has in itself the poetry of the creator being indistinguishable from his creation, which operatic themes address in abundance. More so than its mythical appropriateness, there is this: Peanuts is a strip about not getting what you want, or even getting what you need, but subsisting and surviving and thriving and finding joy in those stark and simple moments and accomplishments — few and inconsistent, and as likely found close to home as half a world away. In Schulz’s world, where children ponder with the philosophic gait of Solomonic thinkers on the eternal and unknowable question of Why, the one eternal truth is you just can’t win — that even when you win, victory and loss are inseparable. The one thing Charles Schulz did not want was to stop drawing. That illness forced him to, that he subsequently passed away as his final strip reached its audience, is an event of such finality that it’s usually reserved for heroic myth and scripted drama. With the clockwork precision of his passing, Schulz insured that no winning game would be pitched from the familiar dirt mound, that the Little Red-Haired Girl would never walk over, that no warm sunny ending would ever settle on the nameless neighborhood where these characters played their roles. The imperfect, flawless, vain and victorless world of his creation persists as it was created, its creator having deftly exited without a satisfying resolution to any running subplot — denying millions who wanted one heart-warming victory on which to go out. And that, in itself, is as perfectly poetic an ending to Peanuts as possible.